Jaipur, Jan 26 (IANS) India’s vibrant publishing market is attracting major international bestselling authors, who say that there is a great potential for their books to find a good readership in India. Once a book becomes successful in the country where it is first published, international rights for the books are acquired by leading publishing houses in other countries. India, being the second largest publishing market in the world, is one hot spot where perhaps every successful author wants to be published. Former British politician and bestselling novelist Jeffrey Archer, for instance, finds more readers in India than anywhere else in the world. In pure statistical terms, his books also sell more in India than anywhere else. What message does it send to award-winning or bestselling authors from other countries? That the market is ripe for harvest! “I think there is a lot of potential here; I know some great writers from India, they write from their heart. I also think it is a great place to publish and I can only see more and more authors coming here,”Australian author Markus Zusak of “The Book Thief” fame told IANS on the sidelines of the Jaipur Literature Festival. Scottish novelist, playwright and short story writer Irvine Welsh echoed similar sentiments, stating that people in India are reading “a lot of books”. He said that festivals like the JLF also provide a platform for authors like him to find new readers. “I think there is a great potential, he said. Pulitzer Prize winning author Andrew Sean Greer, who is on a marathon book tour of India, attending lit fests in Chennai and Kolkata before coming to Jaipur, said that he is excited about the new readers his book “Less” is finding in India. “In the united States, we don’t have a culture of reading many books from outside. We do not import much whereas I find it to be very different here,” Greer told IANS. He said winning an award like the Pulitzer does contribute to international recognition, but maintained that it is ultimately up to the readers, and the reading culture at large. “When I come to festivals like this in India, the one thing that surprises me most is people here read and come. I am saying this because people have asked me questions about my Gay protagonist, which means they have read my book. “Otherwise, they say that I have not read your book, or have read only half. There is genuine interest among readers and I think right now it’s the place where every writer wants to be,” Greer added. Greer also said that while India is a “fascinating market” for international authors, Indian authors should also be published in other countries. 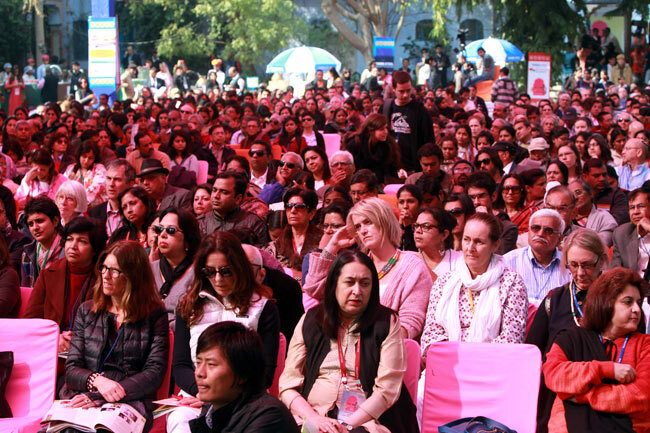 A slew of international authors, including the recipients of major literary awards and those who are a sensation in themselves like Archer, have gathered here to participate in the JLF.